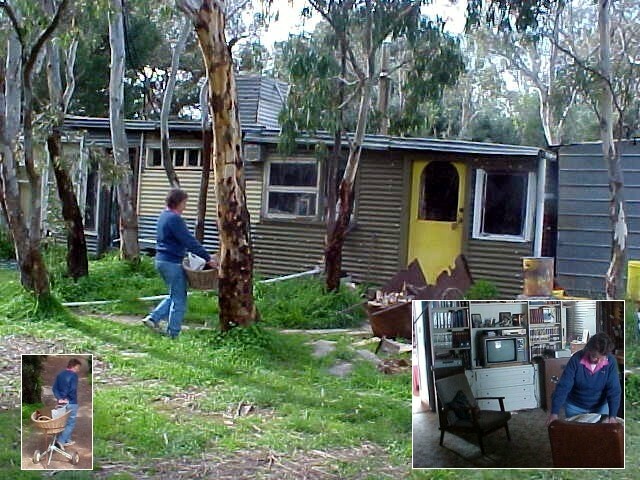 After staying two nights with Tiffany and Steven in the northern Adelaide suburb Oakden, I had to move on again. 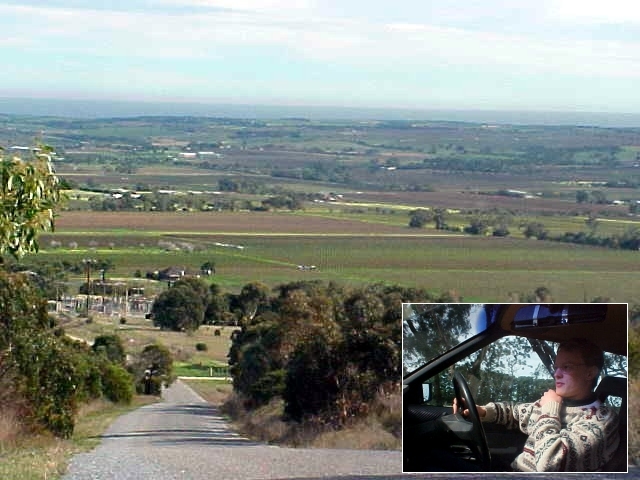 Today I�d end up with Michael Offe and his family in Willunga, who live a very organic life. Tiffany dropped me off in the city centre of Perth before heading off to her work. At the bus terminal I picked up the bus ticket for the Premier Stateliner that my next host had pre-paid for me, so I did not have to hitchhike to this southern township, some 50km from Adelaide. Around 9am in the morning I boarded and I left Adelaide. The scenery changed from the old city centre to brand new suburb estates and again into green bits of cattle land and vineyards. I snoozed away somewhere along the road and when I re-appeared on earth I asked the driver where we were. I had to get out in Willunga. �Oh, that was 3 miles back down the road,� he told me. Oh. So I got off the bus on the Willunga Hill. Fortunately I had not slept the entire trip to the bus� final station. But when I got off the bus I suddenly got this striking pain at my lower back. I couldn�t carry my backpack anymore and could hardly walk! This was scary, because this was a serious interference in my travels. What the heck was going on with me now? 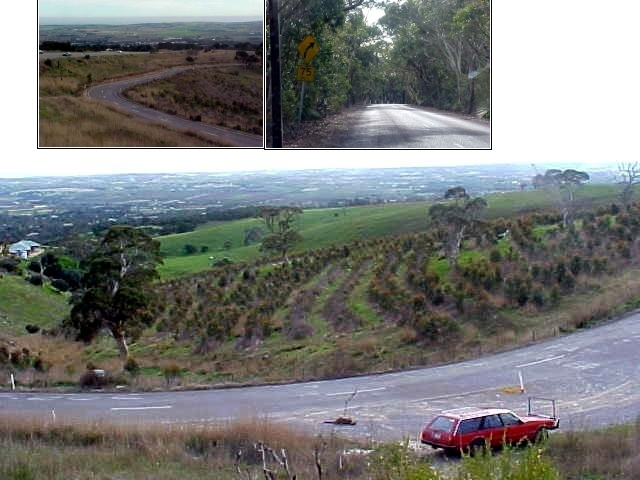 I quickly called my host, as he would pick me up in Willunga, to tell him I was a bit further up the hill. I spoke to father Andrew who would chase down his son on his motorbike and they�d meet up with me soon. Before Michael Offe arrived with his retiring old car, I was already chatting with Andrew, who welcomed me in the area. I told him about my back and he told me I could have some rest at their home soon. Before taking me to his family home just outside of town, Michael took me around for a drive around the area. From the hillside I looked north and could see the flatlands that surround Adelaide, the ocean at the left and the Adelaide hills in the east. Suddenly I had exchanged city/suburb life with life on the farmland again. But meanwhile I felt like an old stooping man, bending over a bit to avoid those pains in my back. Soon we arrived at Michael�s home. His family currently lives in a former chicken shed on their grandparents land, while a new house is being constructed against the old gran� house. The only place that was almost finished in the new house was the kitchen, which was only a bit chilly. I met up with the rest of the Offe family, mother Rilda, father Andrew and Michael�s brother Paul and their grandmother who everybody simply calls Ma. We had a short lunch bite crunching the biscuits that Ma had prepared earlier this day. Andrew is a chemist in organic and natural health products and I soon found out that every edible item in the house was organic. The family baked their own brown bread, ate veggies from the garden and nearby organic farms. Only my coffee was made from Nescaf�. The Offe family first lived in a small town in the east of Adelaide, before coming back to the land where Andrew grew up with his parents. For already a few years Andrew has been working on this new house, that is an extension to his old folks� house and Rilda assured me it is a 50-year-project. Rilda helped me out with getting my stuff from the car to their comfy and warm chicken shed. It might look a strange construction from the outside, but the inside just looks like a fully packed house. With my back still bothering me too much with everything I tried to do, Michael suggested I�d have a lay down. In the meantime he called the local chiropractor to see what she might be able to do with me. In the afternoon Michael took me along to that chiropractor�s practice in town. I had enough fun being an old stoop man already. The chiropractor interrogated me a bit about my medical past (not much to mention) and after filling out a form (�No, I will not sue the chiropractor if my back still hurts�-stuff) she massaged my back. My back was very stiff, she said. When she then bent me in different positions and got some bones crushed (that�s how it felt). �You also sleep on different mattresses every night, that might also be an issue. And add the hours of sleep you had lately, it�s very normal to get fatigue in your back.� She was absolutely right with that. I have afternoon naps, when I can�t have enough sleep at night � and that�s not really healthy. The massage and crushing-bones-part really soften things a bit, but a disturbing feeling is still there. I have to be very careful and move around a bit more, I guess. (No cause can be given to my backpack, because that pack is not supported by my back only, its weight hangs on my entire body with straps around my middle). The chiropractor does not usually give free treatments to travellers, so to ease her comfort, Rilda was given Michael a box of veggies and a big bag of organic potatoes for the lady. �I have never been paid in potatoes before,� the chiropractor laughed. I thanked her for helping me out and she wished me luck with my back. Back at the property of the Offe�s Michael and Paul took me along for a good walk around their land. Andrew and (the very active!) Ma were dumping their garbage on their own compost heap and Paul demonstrated their cable swing that span a long range between two trees. In the kitchen dinner was ready around 7pm and I joined the family at the table. Rilda taught me things about Australian vegetables and I was amazed that I did not know much about them. She showed me samples of their organic food and I had never seen things like that. Or I could not figure out how I would call things like that at home. And most of it would end up in a can, as we don�t have such a variety of fresh vegetables in Dutch supermarkets as the Aussies have here. I already knew Michael Offe before I got to this place. 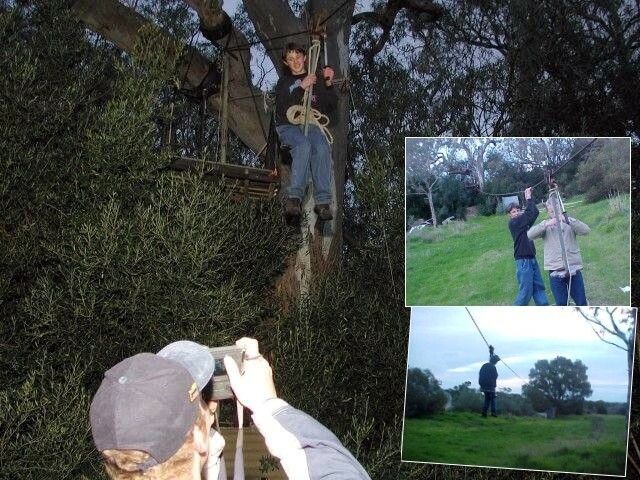 He was the young guy who helped me out with a climb on the Sydney Harbour Bridge when I just arrived in Sydney. Since then he has been helping me out in different occasions, like to get me a sponsor here and there. Meanwhile he has set up his own company, which produces the famous Magic Bracket. This is a bracket that can be used to get your professional flash on digital cameras, so you can take some more professional photographs. I had already figured out that Michael was quite a photographer, because wherever he took me, his camera (with bracket) would come along. The idea for the Magic Bracket was simple. He had a digital camera but wanted to get a better grip on the entire thing when you attach an external flash on it. Non-digital cameras like Nikon already have this connection for a big flash, but digital cameras mostly have a simple built in flash for small distances. He noticed on the internet that photographers from all over the world were looking for a bracket that would make their digital photography a bit more flashy and with some help from his dad, Michael set up his company and started producing the brackets. On his computer brother Paul showed me the production process for the first samples. I saw how the bracket was made from nothing to the final result. Quite an extensive machinery process, I say! But as Michael is a bit low in budget, it�s hard to get the publicity for his product. Photographers� media is interested, but they also require a few freesamples to test it all out. That just has to wait a bit. Dinner ended around 10pm in the night as we talked a lot about those differences between life in The Netherlands and Australia. Rilda could almost not believe that we have less free fruits in my country. Yes, if you have a small vegetable hobby garden, you can grow your own potatoes, tomatoes, carrots, beans and strawberries, but that�s a bout it. I never heard anybody in Holland growing bananas, pineapples and squash in the open air; it�s just a bit too chilly for it. Later the evening massive rain was coming down the sky and with a torch we had to run from the construction house back to the shed. The family was also amazed with the fact that the entire day as I had experienced it so far, was a typical summer day in Holland. Even though Australians call this a cold winter. 17 degrees Celsius is pretty average for a Dutch temperature and we take those rain showers for granted. In the shed the fire in the heating was built up to make it a warm place for the night. While sitting behind my laptop for the necessary daily updates, I noticed how Rilda appeared with a big box of organic (not chemical junk) supplemental vitamin pills. Everybody seemed to be taking different pills before heading to bed and I was quite surprised with that. If you have so many fruits and veggies in Australia, why should the vitamin pills be worth swallowing? But Andrew advised me that they would give you the everyday protection. One pill was, for example, good for the fat of one whole salmon, which is good for your muscles and immune system. I had to held up my hands: �Here you have a dozen of these, a few of these and a few of these.� It looked like I was holding M&M�s in my hand. �This would get you through the coming days,� Rilda said. The family went to bed and Michael and me were the late night computer freaks. While I typed my thing, he was editing the digital photographs he had made of my stay for a day here.